Recently, there has been a spotlight on America’s prescription opioid misuse and overdose epidemics. However, too often, people remain unaware of the related hepatitis C virus (HCV) epidemic. The Centers for Disease Control and Prevention (CDC) reported an estimated 150% increase in new HCV infections from 2010 to 2013 and, further, that most of the new infections were associated with injection drug use. An analysis of state and national data indicate that a large proportion of new HCV infections are occurring in young people (<30 years of age) in rural and suburban areas who use oral prescription opioid analgesics before transitioning to injecting. At the same time, recent years have seen advances that have revolutionized the field of hepatitis C. Groundbreaking treatments with cure rates as high as 90-100% are now available. Preventive screenings without cost-sharing under the Affordable Care Act make HCV screening more accessible for many people. And the national Viral Hepatitis Action Plan (ATTC) network is a Substance Abuse and Mental Health Services Administration (SAMHSA)-funded, nationwide resource for professionals in the addictions treatment and recovery services fields. In 2011, SAMHSA tasked the ATTC Regional Centers with developing a national HCV educational initiative targeting behavioral health and medical providers. Since over half of new HCV infections are associated with injection drug use, the ATTCs were uniquely positioned to address the hepatitis C epidemic through existing expertise and connections with the behavioral health workforce. The timing was perfect to bridge the gap in the behavioral health workforce’s knowledge about HCV as well as provide cross-training in behavioral health for medical providers. 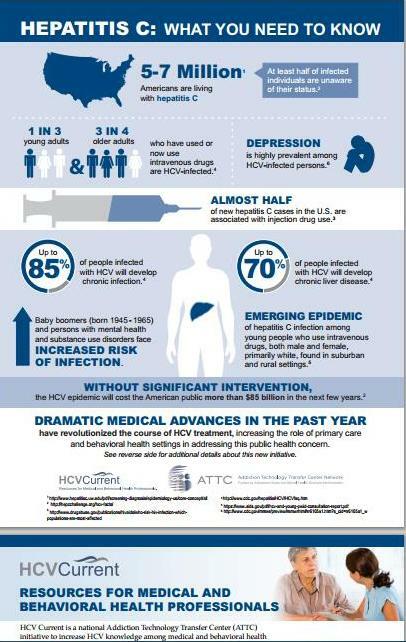 As a result, the HCV Current initiative was launched in March 2015. HCV Current provides free HCV informational resources for health professionals, including online and in-person curriculum and training, downloadable provider tools, and region-specific resources. As new HCV research emerges, these products are updated. The tools available on HCV Current can help empower health care professionals to better educate patients about what to expect along each stage of the HCV continuum of care, including screening and understanding treatment options. Providers can also download patient education resources, including fact sheets. To augment the HCV Current initiative, one ATTC Regional Center took a novel approach to enhance the effort by engaging regional expertise. The Mid-America ATTC (which serves HHS Region 7) formed an HCV Stakeholder Group of experts from Iowa, Kansas, Missouri, and Nebraska. Composed of CDC-funded Viral Hepatitis Prevention Coordinators from those states and other stakeholders, the group provided expertise in the development of a free, 1.5-hour self-paced online course, HCV Snapshot: An Introduction to Hepatitis C for Health Care Professionals. Continuing education for this course is available for nurses, social workers, addiction professionals, Certified Health Education Specialists, and others. The HCV Stakeholder Group members also serve as regional trainers on behalf of Mid-America ATTC and welcome additional collaborations. Stakeholders provide 3- and 6-hour trainings in their respective jurisdictions for free in collaboration with Mid-America ATTC. The partnership between the Viral Hepatitis Prevention Coordinators and the Mid-America ATTC supports collaboration and integration between behavioral health and medical providers. The HCV Current initiative illustrates important progress in community stakeholder efforts toward achieving the goals of the national Viral Hepatitis Action Plan. The Initiative creates new partnerships to leverage existing resources, increases provider and system capacity to deliver HCV services, and builds momentum in our national response to this now-curable infectious disease. Viral Hepatitis Prevention Coordinators are key resources within their states and those involved in the Initiative have already experienced a shift in improved provider perceptions, engagement, and knowledge. This is an exciting time both nationally and locally, as we develop better tools and resources to empower providers in every community and improve the quality of lives in our communities by preventing and curing HCV. To locate training opportunities near you, check the HCV Current’s Training and Events calendar or contact your regionâs ATTC.